if (l <= 0.05f) continue; // don't draw if it's too dark. 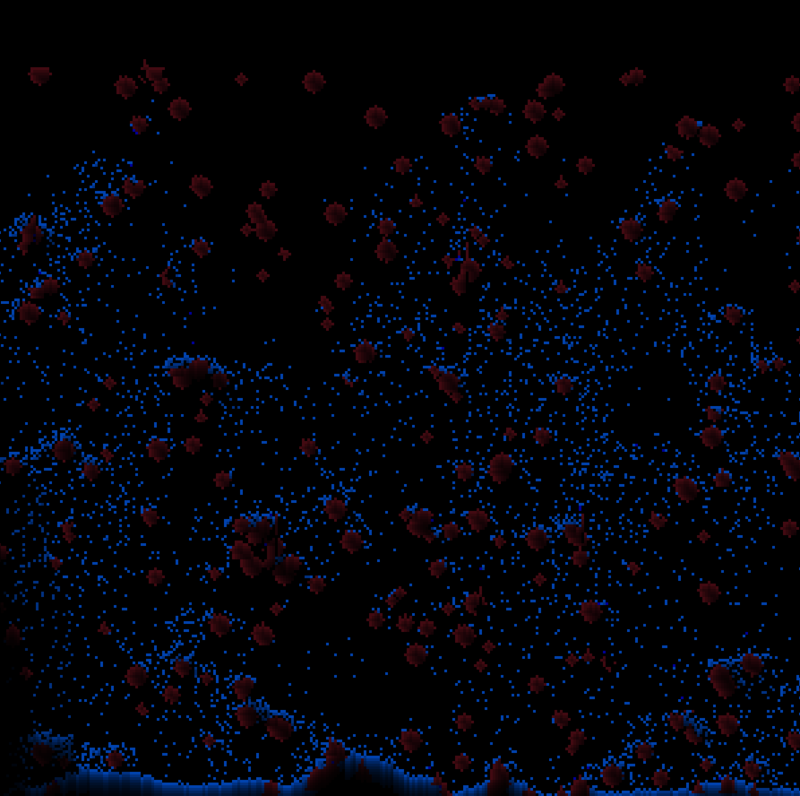 ambient_light[x][y] = max * 0.75f; // TODO: add constant to particle properties for transparency -- use that here. It would be very interesting to hear suggestions as to how these approaches to rendering and lighting calculations could be improved. It seems rather inefficient to create a new lighting array each frame, but I'm not sure how I could do much better, since many of the particles shift around frequently. Similarly, it seems that drawing could be improved, but I lack the knowledge to do so. If any clarification would be useful, please let me know. The approach used to draw particles is based in part on the responses that I got from this question. From where I sit, this seems to be implemented backwards. You're iterating over every pixel in the viewport and checking to see if it has a particle, then doing something with the particle. It seems like it would be way more efficient to iterate over the particles and calculate the values needed for each particle. You're doing n * m operations for the lighting, then another n * m operations for drawing the textures (so it's essentially O(2n2)). You could do the operations only for the particles and cut it down to O(2q) operations (where q is the number of particles, which looks to always be smaller than m * n). If instead, a particle held an (x,y) position, and a lighting value, you could simply iterate over the particles and calculate the new lighting value and then draw them. One of the difficulties with just doing the operations for all the particles is that the world is rather large. There are many more particles than those just displayed in the viewport. It would be prohibitively slow to calculate lighting and render every particle (> 10,000,000). The solution to this is to use an appropriate data structure. In this case a k-d tree in 2D might be a good place to start. You would check only particles whose segment of the tree intersected the viewport, and leave out all other particles. Not the answer you're looking for? Browse other questions tagged java graphics libgdx or ask your own question.